For more information about this event, please contact Mighty Communication at mighty.communication@gmail.com. ???????? 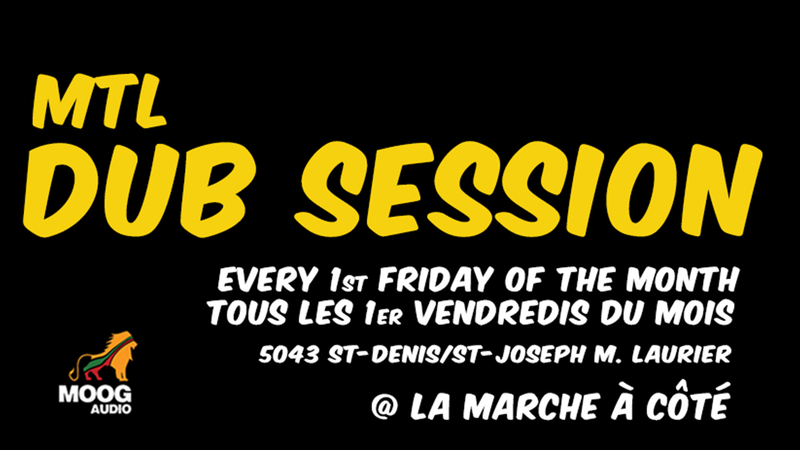 EVERY 1st Friday of THE month | Tous les 1er vendredis du mois with original Live Mc's // & special Dub Music Djs ???? BLACKOUT SOUND SYSTEM, A REGGAE / DUB SOUND, IS MADE UP OF A CREW OF MEN WHO WERE RAISED IN THE CARRIBEAN BUT WHO ARE CURRENTLY LIVING BOTH IN CANADA AND FRANCE. ESTABLISHED IN 2002, THIS CREW HAS SPENT THE LAST 15 YEARS LEARNING THE JAMAICAN REGGAE MUSIC & CULTURE, PERFECTING, AND PERFORMING THEIR CRAFT. THEY ARE CURRENTLY INVOLVED IN RECORDING AND SELLING DUBPLATES FROM WELL KNOWN ARTISTS, CREATING AUDIOVISUAL AND MEDIA CONTENT, PROMOTING UPCOMING AND NEW ARTISTS, EVENT AND FESTIVAL PLANNING, AND PERFORMING IN LIVE SHOWS. BLACKOUT SOUND HAS PERFORMED AT MANY SHOWS THROUGHOUT EUROPE AND NORTH AMERICA AND PLAYED ALONGSIDE MANY INTERNATIONAL ARTISTS SUCH AS U ROY, EARL CHINNA SMITH, STEEL PULSE, GONDWANA, ALBOROSIE, ANTHONY B, JAH9, ADMIRAL T, DANAKIL, DUB INC, RAGGASONIC, BOUNTY KILLER, BEENIE MAN AND MANY MANY OTHERS. THE CREW IS DEDICATED TO SPREADING GOOD VIBES, PERFORMING ORIGINAL SHOWS, AND KEEPING THE CLASSIC ROOTS CULTURE ALIVE. BLACKOUT SOUND HAS A VERY POPULAR MTL DUB SESSION NIGHT IN MONTREAL THAT REOCCURS MONTHLY. WITH A LIVE MC AND A 90’S OLDSCHOOL FLAVOR, THESE NIGHTS ARE GROWING IN POPULARITY AND KEEP PATRONS COMING BACK MONTH AFTER MONTH. PEOPLE COME TO DRINK, LAUGH, DANCE, SOCIALIZE, AND VIBE IN A PEACEFUL FUN ATMOSPHERE. THE CROWD IS DIVERSE AND ALWAYS ENJOYS THEMSELVES. THROUGH THESE NIGHTS, BLACKOUT SOUND HOPES TO BRING NEW PEOPLE INTO THE REGGAE NÜ-ROOTS AND DUB SCENE. BLACKOUT SOUND SHOWS ARE AVAILABLE FOR WORLDWIDE TRAVEL AND BOOKINGS. PLEASE CONTACT US THROUGH ANY OF THE LINKS LISTED BELOW.